This is the earliest trade catalogue we have in the Newman Brothers’ collection. It most likely dates from around 1894 or just after. It only contains brass products, which is consistent with the company’s manufacturing processes at this time. They were brass founders, and brass was the material they knew well. 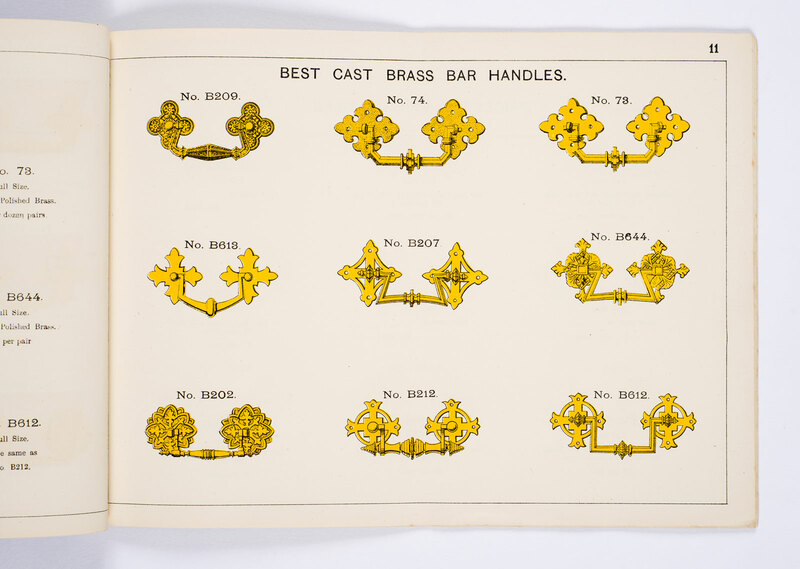 This page of ‘best cast brass bar handles’ was top of the range and was reserved for the middle and upper-class funerals. Traditionally, a coffin would have been adorned with six to eight of these handles, often paired with back plates, which came at a greater cost. Brass furniture would have been placed on a coffin with a light veneer, often elm. At this time, there were already of finishes widely available for coffin furniture including gilt copper, copper, bronze, brass, silver and ‘white’ (tin-dipped stamped iron). Black or japanned furniture was also available, which again was often tin-dipped stamped iron, painted with matt black paint. Raised details were then highlighted with water-gilding. Click here to see an example of a gilded, japanned breastplate manufactured at Newman Brothers.